Brussels~ Beer beer and more beeeerrr! 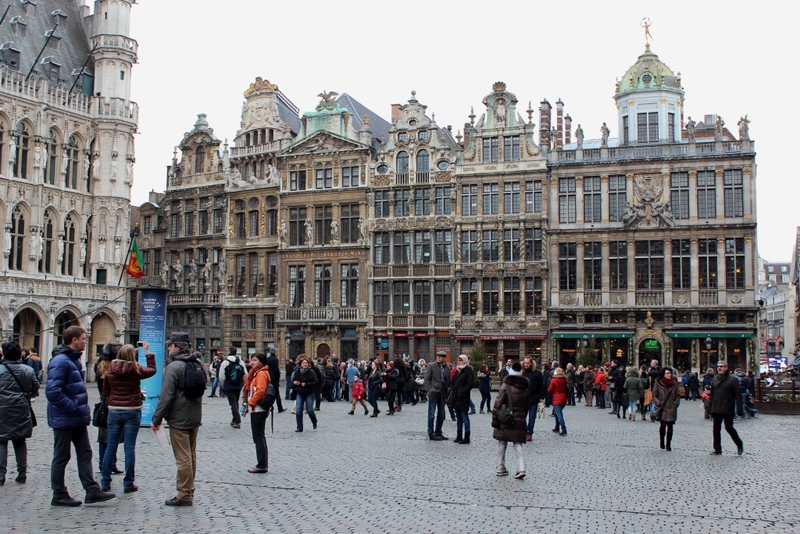 I went to Brussels about five months ago, er, at the beginning of January… haha My life had gotten a bit hectic with apartment issues and it worked that I had a couple days in between apartments, so I decided to go on a trip. 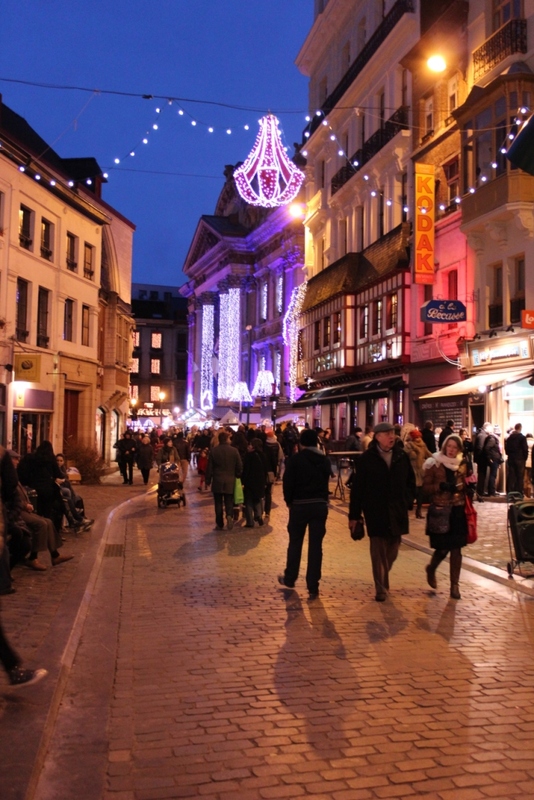 I had five days to figure it out, and being the absolute worst at making up my mind, I took three days to decide, changed my mind after booking an entire trip to Lille, asked multiple people for advice, and then finally decided on Brussels, just two days before I was set to leave. Since it ended up being so last minute, I jumped on the train by myself and set out to drink lots of beer, eat frites, and do a bit of exploring. I arrived not knowing what language was spoken or if euros were used. 😀 But I did know where I was staying! In the taxi to the apartment I was staying at I asked the driver in French which languages were spoken in Brussels- French and Dutch. Pas de problem..c’est facile! 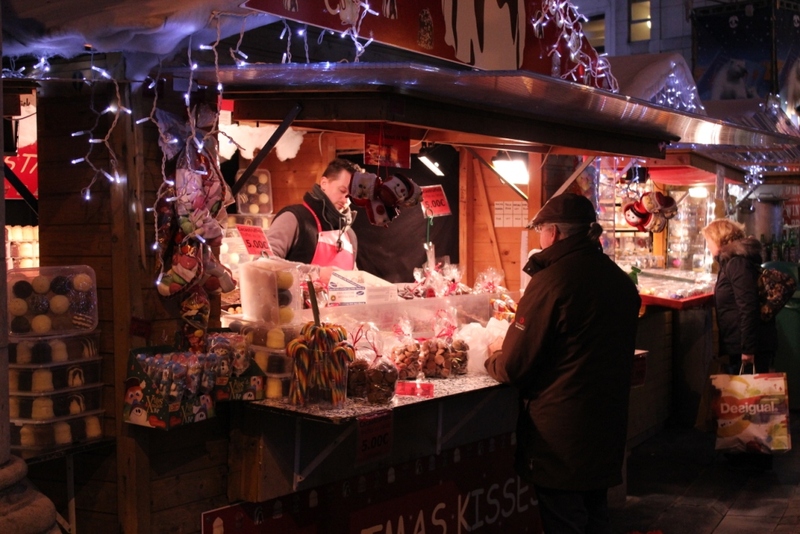 And, the Christmas decorations and market were still up! It was fate! I did want to have another Vin Chaud..
My trip started with the best thunderstorm I’d experienced in months. 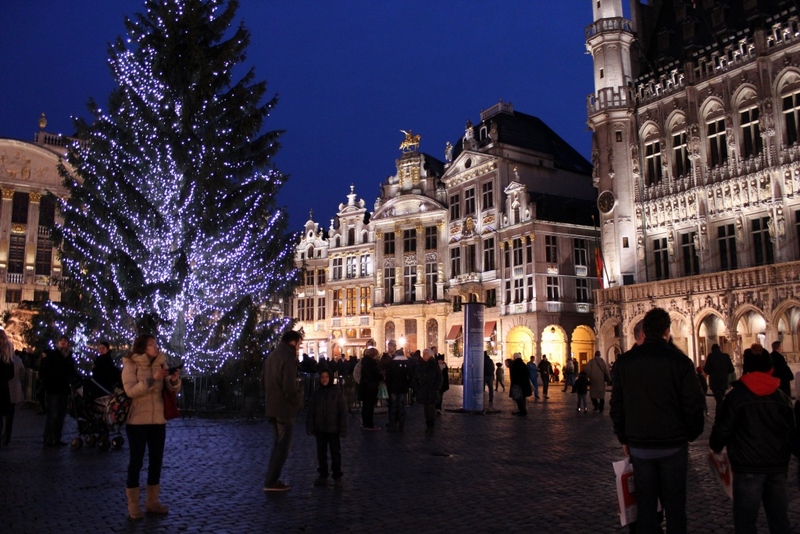 I’d gotten to Brussels around 6pm and decided to wander around for a bit before heading to bed. It popped up all of a sudden. There was thunder, hail, wind, and lots and lots of rain. It was amazing! I love a good thunderstorm! Before running for cover under a store awning, I’d happened upon a traveling circus and a store that only sold bonsai trees. Right before I headed to bed I planned out the next three days I had there: tomorrow, a 4 hour highly rated beer tour. The next day, a day trip to Bruges and Ghent, and then just a bit of wandering and some work before I headed back to Paris. The next morning I set out for the center of town to the meeting place for the tour. 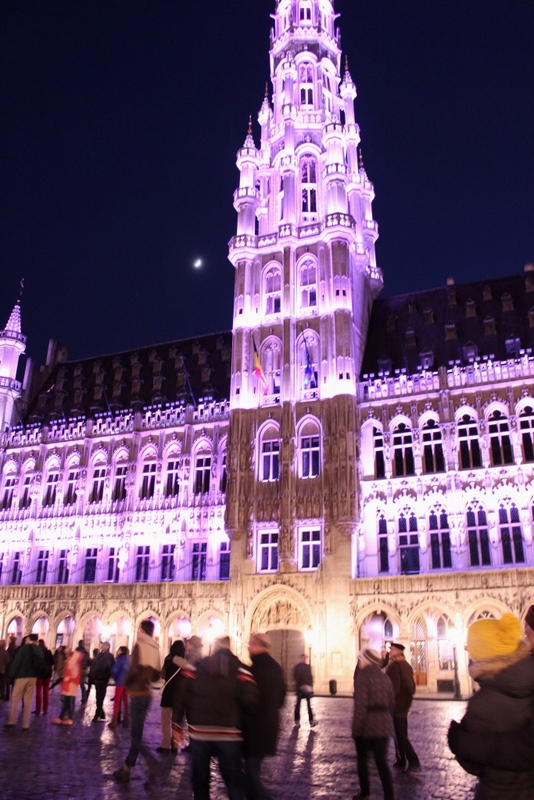 And wow was blown away at the Grand Place. On each side of the square was a different style of architecture. The buildings looming above you. And oh so beautiful in their design. Seconds later I met the Brad Pitt look-a-like tour guide for the soon to be solo beer tour. Yes, I was well on my way to drink lots of beer in lots of different bars for the next couple of hours… No complaints here! I think we tried 7 kinds (it got a bit fuzzy toward the end), starting with the lightest and most bitter. 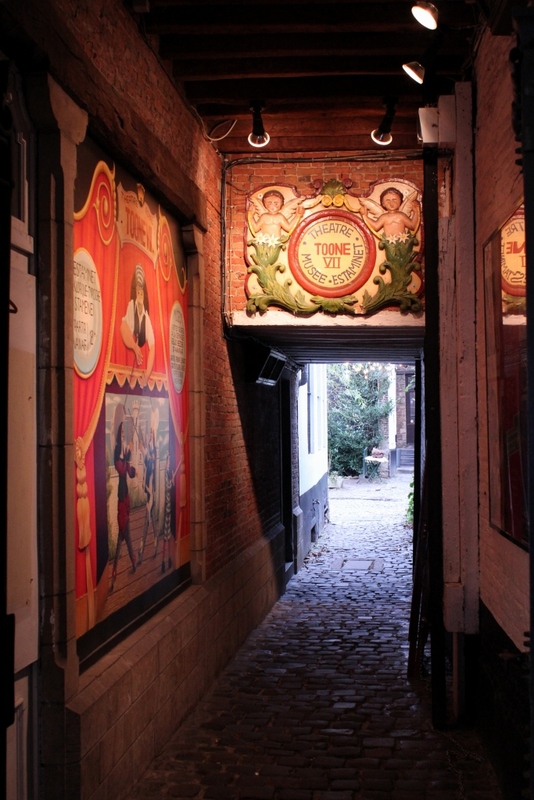 Our first stop, an old marionette theater/bar visited by the king and queen of Belgium several years ago called Toone. We walked down a road and then a small corridor past an overgrown garden to the entrance to a bar not so many people would know about. There was a resident cat and marionettes hung along the walls. A neat place to stop off the Grand Place for a drink. 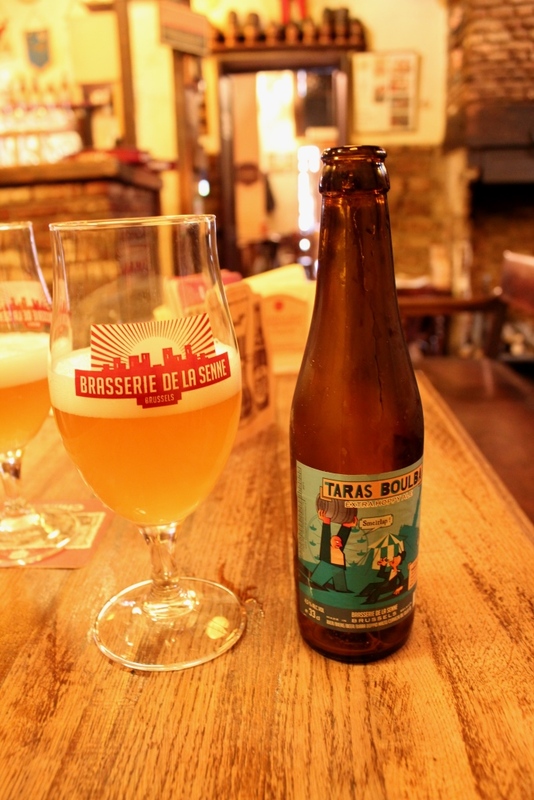 The first beer on the list- Taras Boulba, a pale ale brewed locally in Brussels…. and what I would learn was my least favorite. Too bitter for me! 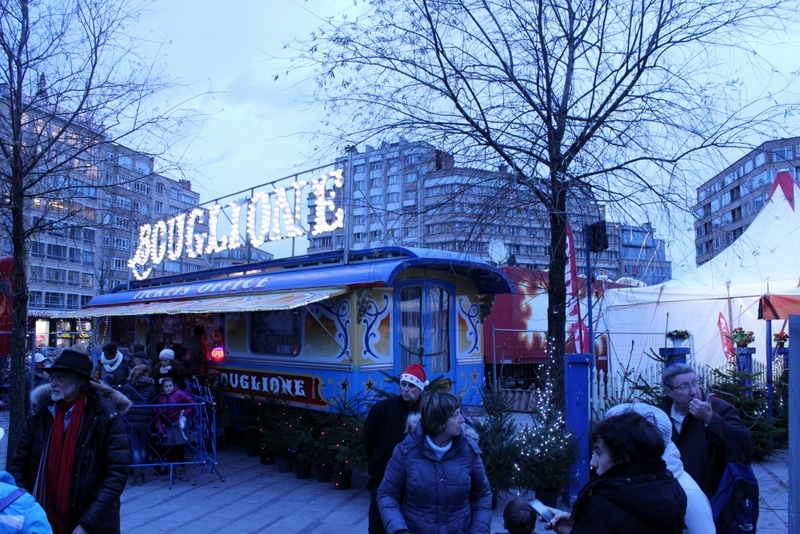 He was right- it was very cool and set up for chocolate, cheese, and beer tours with a long table. We had two beers there and one that will be my go-to summer beer. 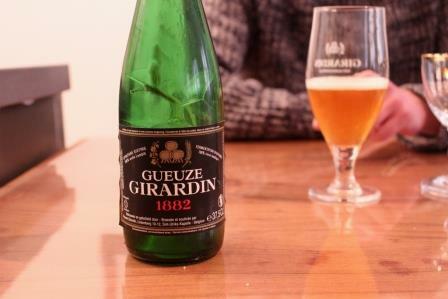 Gueuze Girardin – one I don’t remember too well, because I was in love with the other beer. Maybe I should have been taking notes…? It was again, too bitter for my taste, and very carbonated. Love the big bubbles in the bottle. Hello there! This is Stefan, my guide for the day- extremely knowledgeable about beer, and also working on a script for a tv show! I forgot to mention that the private residence was the home of the owner of the touring group who happened to join us for a glass while asking me questions and winking at his counterpart.. It ended up being a very one-sided conversation as I tried to change the subject. So you’re American? yes.. Living in Paris? uh hum And I heard you’re a pastry chef? yes That’s fantastic! (wink) oh wait- not a wink by me, by him And you’re traveling alone? uh hum So you must be pretty independent? haha I guess so! And then we ate cheese. 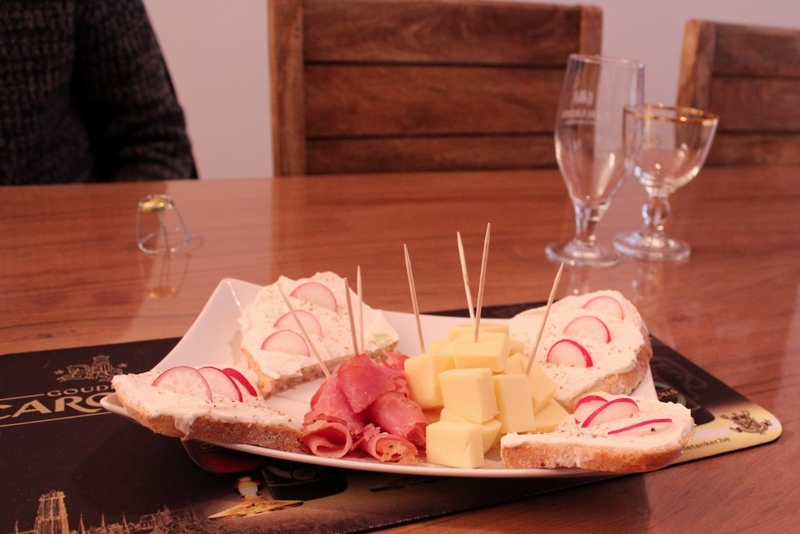 A soft cheese, with pepper and radishes on top. And talked about more important things like beer. 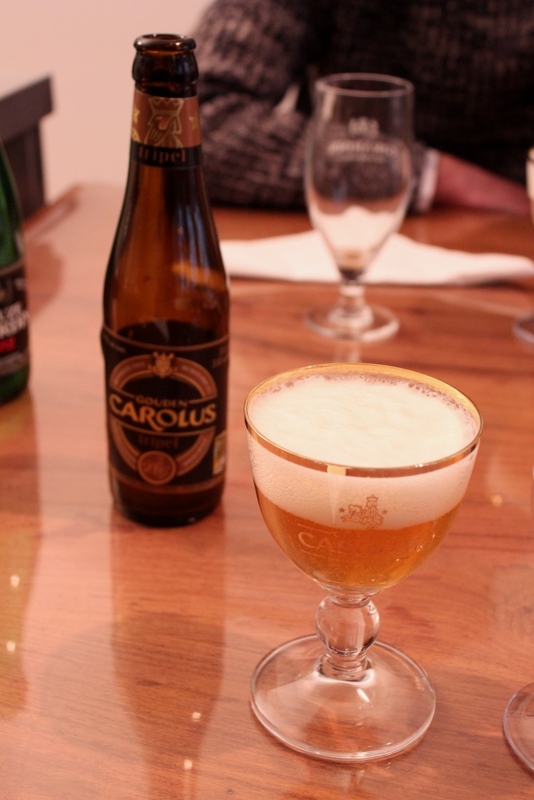 Like my favorite beer on the tour, Gouden Carolus Tripel– before we got to the darker beers that is. Light, fruity, refreshing but as my research tells me- elegant and complex. 😉 I’m definitely going to be scouting this one out this summer! A bag of chocolate on the way out and a taste of barley. I didn’t eat the two together. 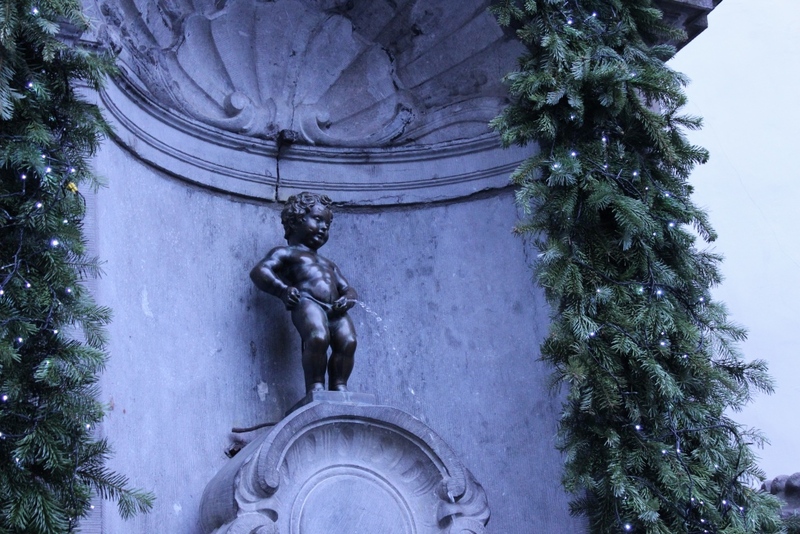 And we saw the girl version of Manneken Pis doing her thing. And on to Deliruim Cafe where I was too distracted by putting celery salt on cheese to remember how the beer was. 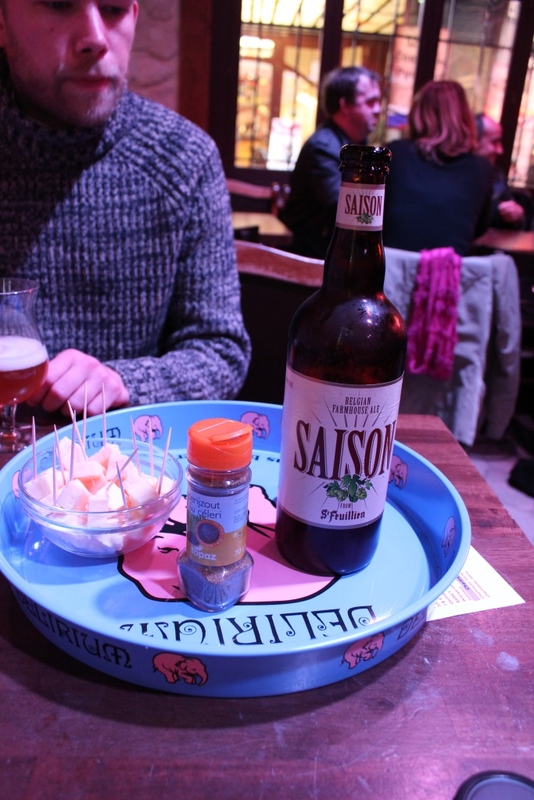 Saison – a complex farmhouse ale that was quite delicious with the cheese. 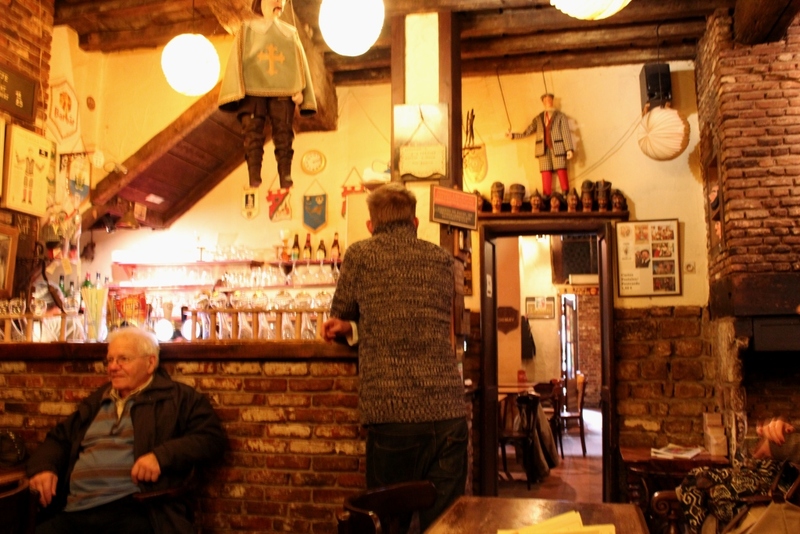 Another bar, another beer- this one made by monks. I must say, if I were a monk, I would be a trappist monk. 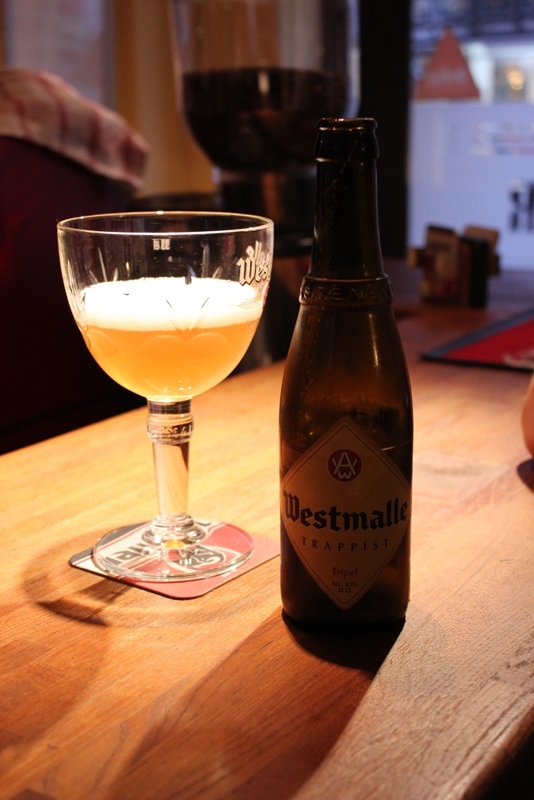 Westmalle Trappist Tripel – Brewed at Westmalle abbey, which was founded in 1794. The recipe of the beer was constructed in 1934 and is a strong pale ale. 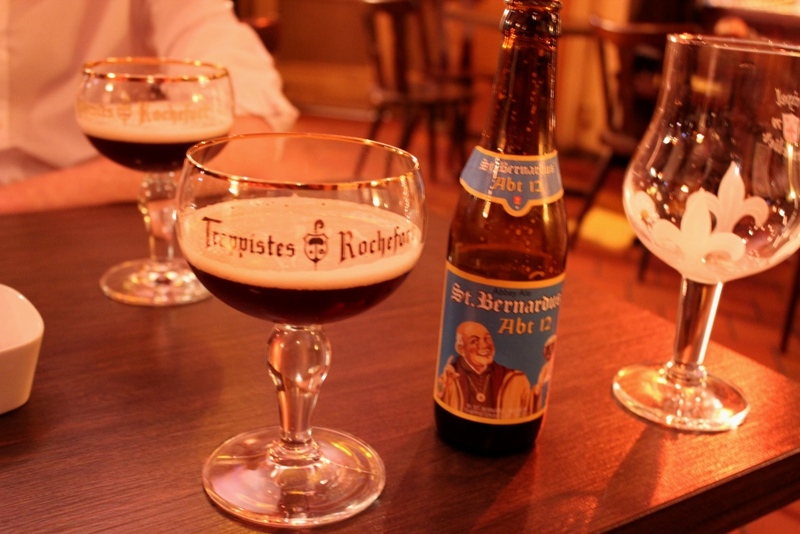 There are only 10 monasteries that brew beer (6 in Belgium, 2 in the Netherlands and 1 in the US). 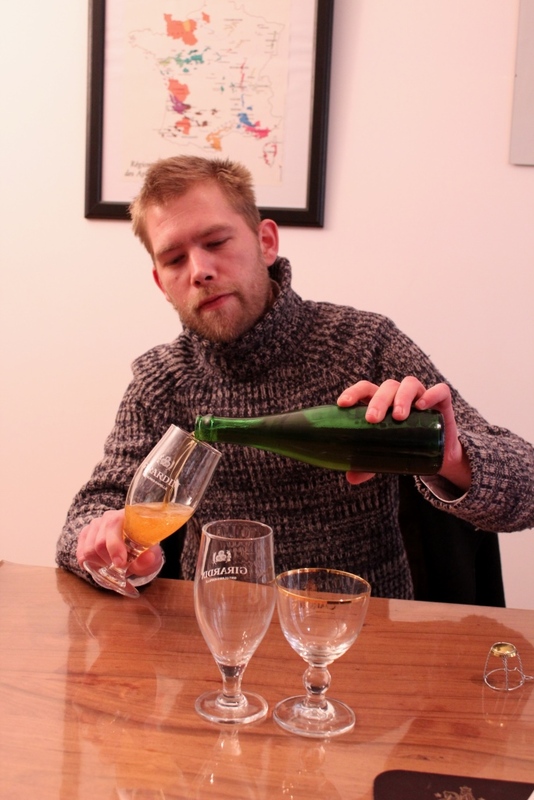 For beer to be called a “Trappist Beer” it must be brewed in a Trappist monastery and not for profit. So you can feel mighty good about drinking a lot of this beer! 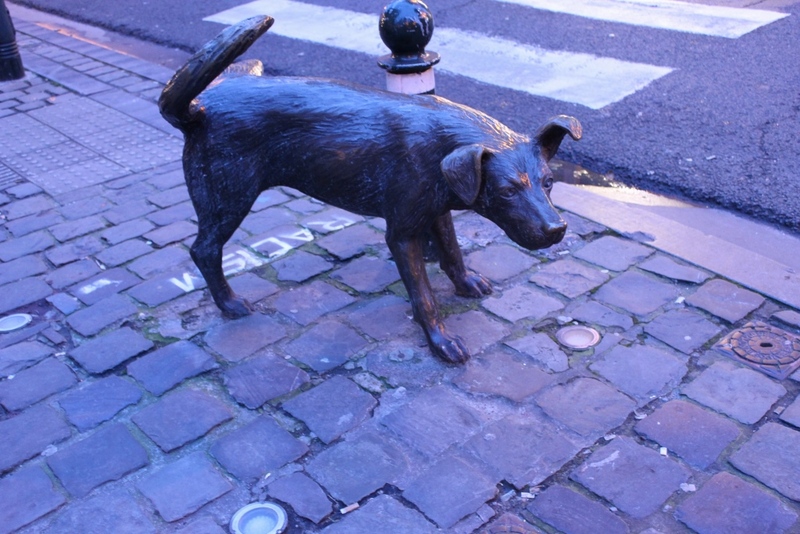 Onwards, past a dog doing it’s business (I’ve never quite got the meaning of all the peeing statues…? 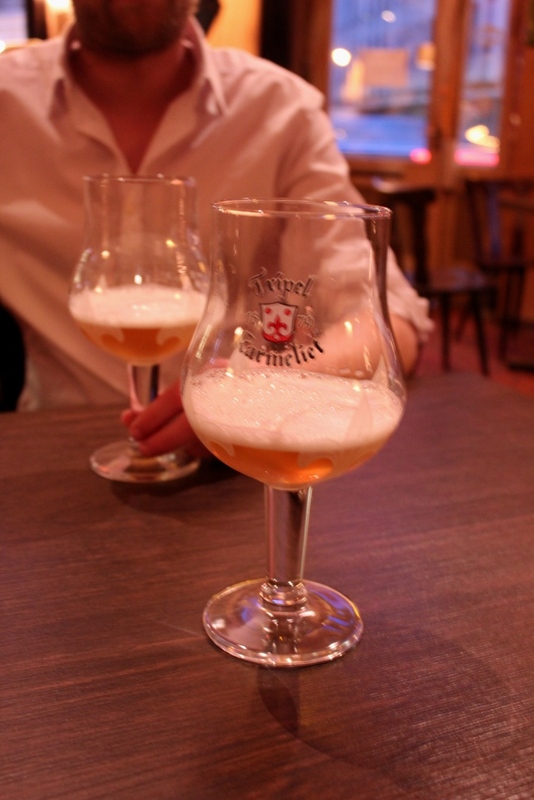 ), and to another bar for two more beers, one with a very saintly name..
Tripel Karmeliet – fruity, yeasty, and like wine, it matures in the glass. And on to that saint-like beer, the darkest of them all… St. Bernardus Abt 12, and with the most alcohol content of them all at 10.5%. What a doozy! I did tell you I liked dark beers. And it was pretty glorious. And the trip to Bruges and Ghent I planned on taking the next day… with a 8am start, it will be on my next trip to Belgium. 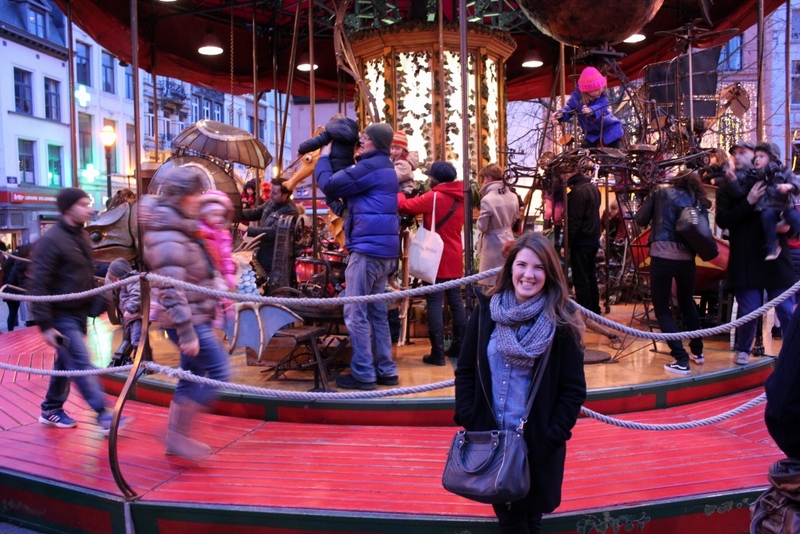 There was a cool carousel. 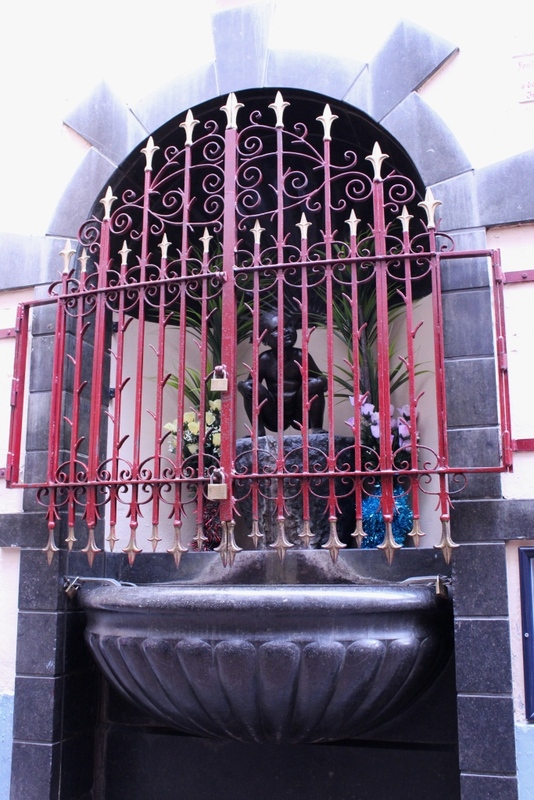 And of course.. the famous Manneken Pis. Sadly he was not wearing a costume the day I visited. – Do the beer tour! Lots of fun, lots of beer! – Absolutely get some chocolate. I liked Neuhaus the best and believe me I tried a lot of chocolate. 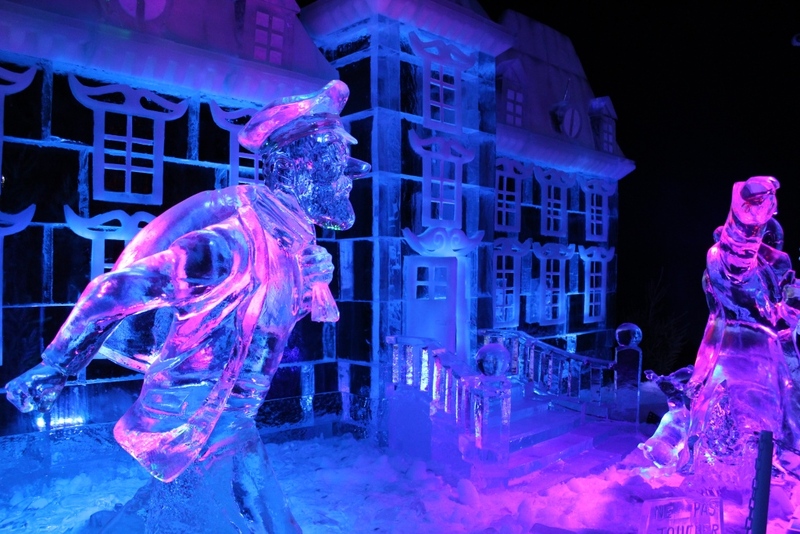 – Visit Bruges (I heard it’s amazing). 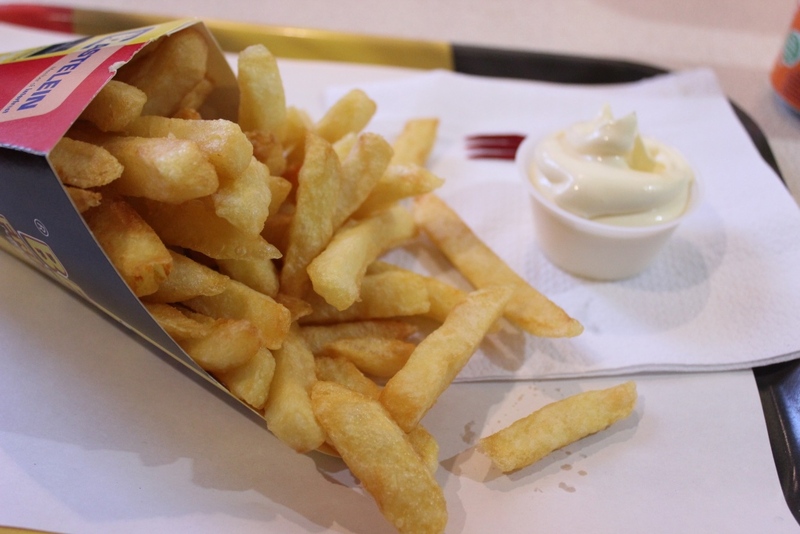 – To Eat: Frites & Waffles! 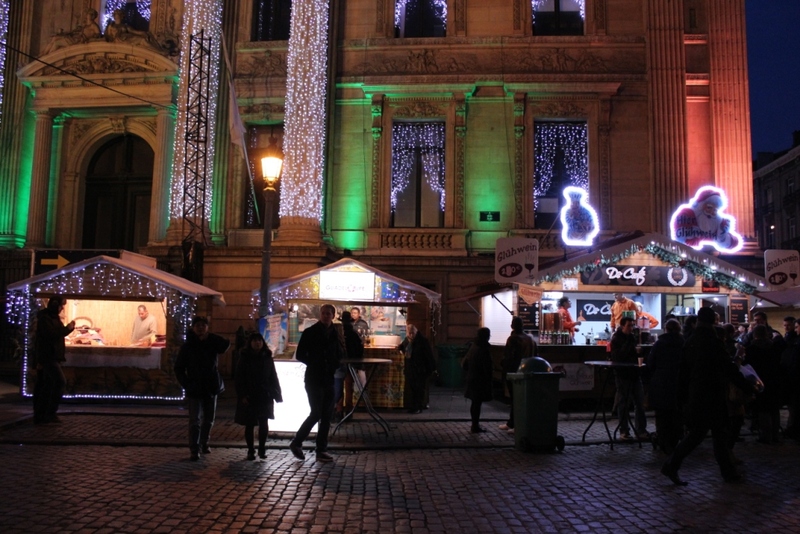 There are two “battling” french fry places right off the Grand Place. – How long to stay? 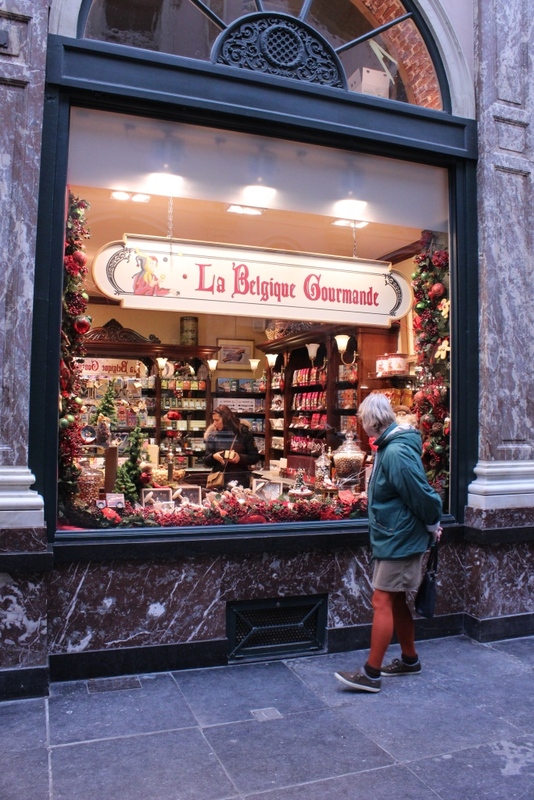 You really don’t need more than two days in Brussels, unless you’re doing day trips. – Where to stay? I 100% recommend staying with Elf and Garret. – Get lost? There are super handy green posts all over the city pointing to the nearest attraction, making it easy to wander around without pulling out a map. Tonsils ~ Be Gone You Pests! oh and Adenoids- You too!